A sophisticated statement, and an irresistible invitation. Rose and gardenia lend a feminine grace to vetiver and black and white cedars. At the core, notes of musc offer undeniable warmth and sensuality.Evoking mystery, attraction, and exquisite desire, NARCISO embodies the scent of seduction. Ok, I never ever post about fragrances because perfume is such a personal thing. Everyone has a different opinion on what's a great scent or a non so great scent. Everyday I encounter men and women looking for that special fragrance, looking for that something special, that mmmm you smell so good reaction. I have my favourites and I know what I like, I love spicer, sweet, powdery woody scents like coco Chanel, angel, black xs, haute couture. I know, I don't like floral scents. 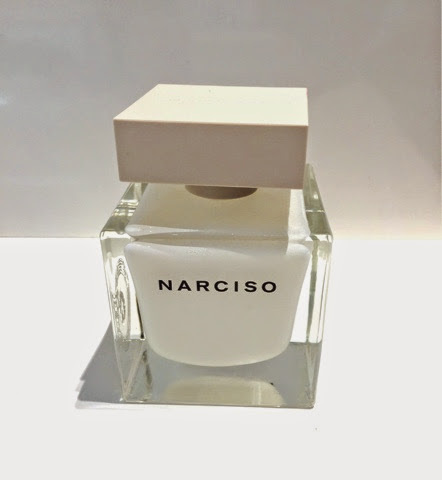 That being said, this new eau de perfume Narcico by NARCISO Rodriguez is everthing I though I didn't like in a fragrance. Top floral notes: Rose and gardenia..what I like florals now?? Bottom notes(the heart of fragrance): black and white cedar..hello woody notes! It's a perfect combination, I've been wearing everyday for the last week and I must say I'm in love with NARCISO. The bottle is so elegant and heavy, giving it that's oh so expensive feel to the fragrance even more. the perfume is a milky white which is not seen in many fragrances.